The sun is shining again in the rain forest; you can see it in the patch of bright blue sky and the dappled, lush undergrowth where the gorillas now cast their own shadows. You couldn’t see those shadows and sunlight before the thorough cleaning, relighting, repainting and reinterpreting of the gorilla habitat scene. Now, seven months after the first thorough overhaul of that diorama and also the takin diorama, both are being resealed this week. And the difference is stunning. 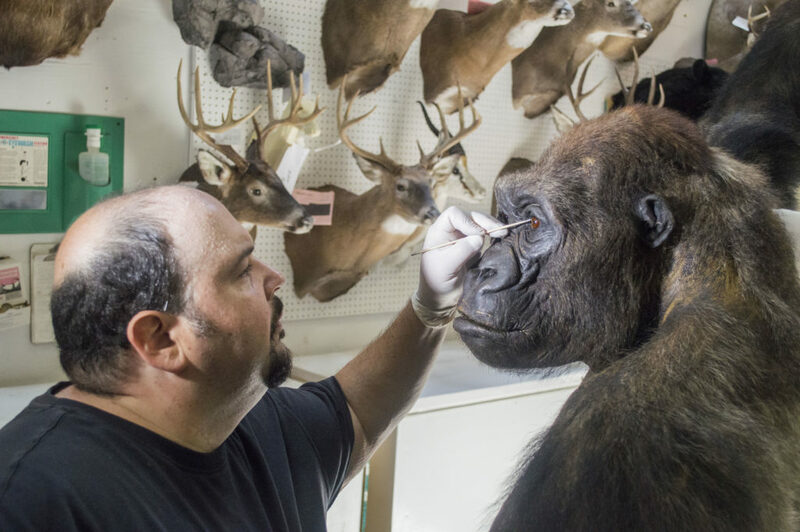 Taxidermist George Dante of Wildlife Preservations at work in his Woodland Park, N.J. studio. 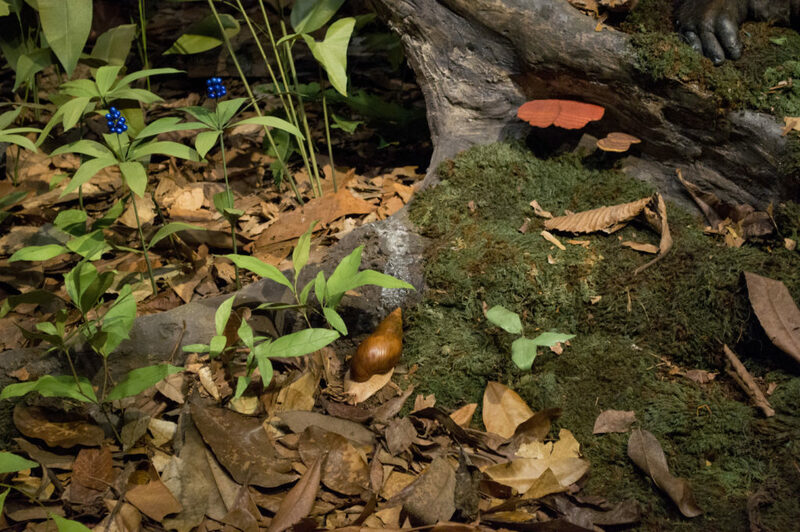 Still to come are new labels for both dioramas, including videos that invite visitors to explore more about the featured animals, plants and ecosystems depicted. In this Part 1 of a two-part post, we highlight a few details showing before and after images for comparison. 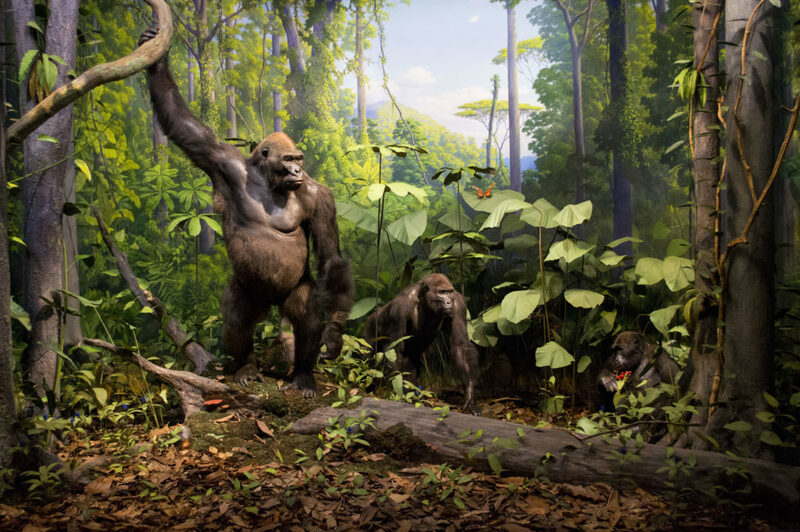 The gorilla diorama opened in 1938 with animals and plants collected by the George Vanderbilt Expedition of 1934 to what is now the Central African Republic. The renovation was funded by generous gifts from Lucille Vanderbilt Pate, the Vandy Charitable Foundation, and Barbara Oldenhoff of Philadelphia. Mrs. Pate of South Carolina is the daughter of the explorer George Vanderbilt. 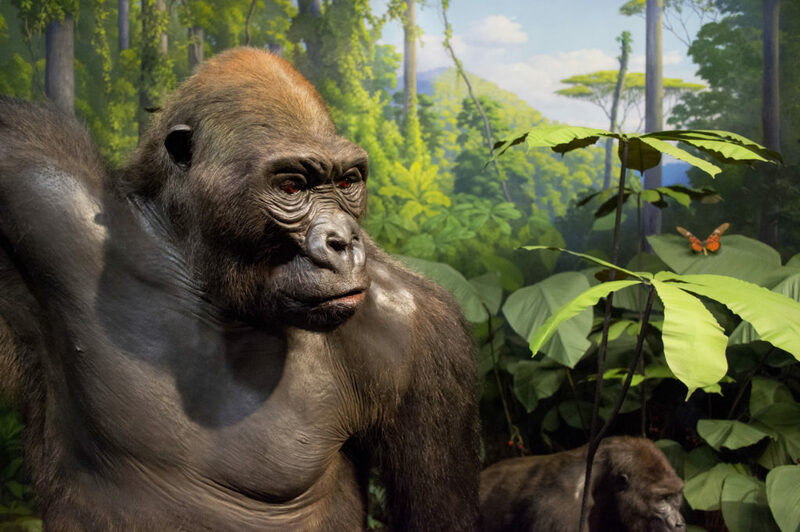 At the time it was installed, the main gorilla was said to be the largest gorilla in the world. On close inspection, the taxidermist discovered that its skin was pieced together from other gorilla skins. “I found that really surprising,” said George Dante, head of Wildlife Preservations. 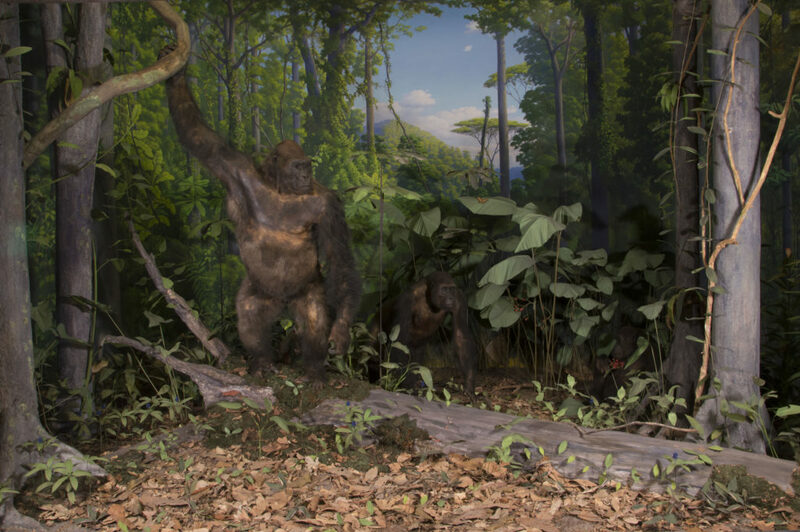 “The way it was done was absolutely fantastic.” Dante said the explorers who collected the gorillas were most likely hampered in the preservation process by the warm climate. Skin starts to spoil quickly and when it went through the tanning process it was not in good shape so they had to piece it together. One of the other noticeable improvements is the clarity in the eyes. The original shellac that coated the eyes didn’t age well. Over time, it turned cloudy. Removing it revealed those rich, vivid, brown tones. 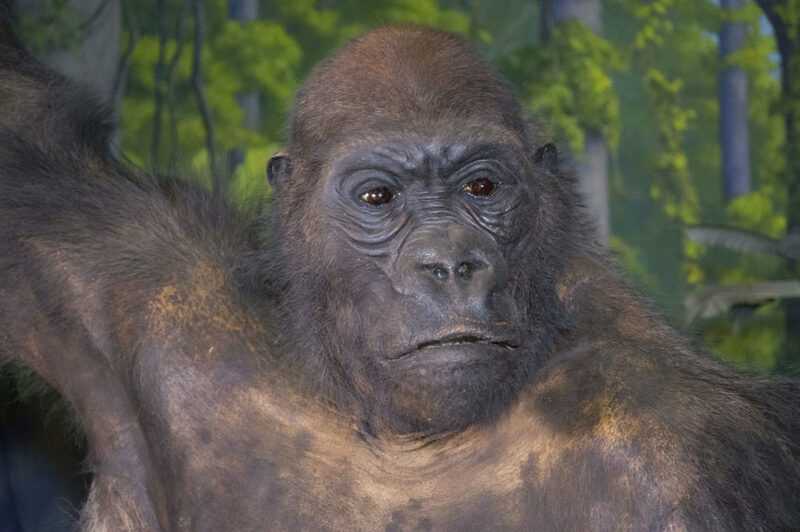 The majestic expression on the refurbish gorilla once again makes clear that he is King of the Forest. After some research, our entomologist determined that the original species of swallowtail butterfly did not live in that region of Central African Republic. 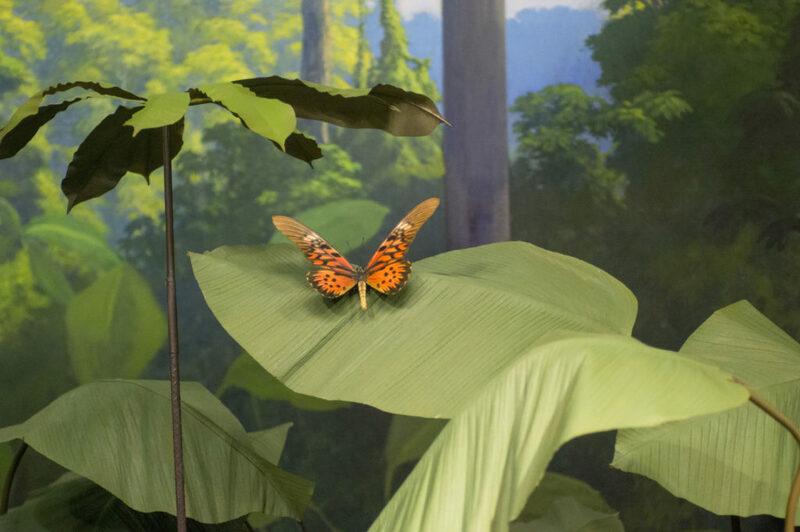 We replaced it with an exquisitely detailed model of an African giant swallowtail. 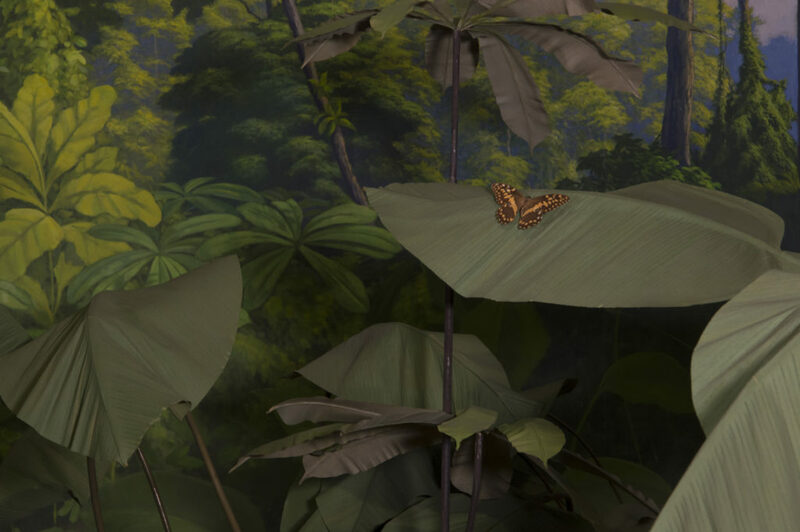 Since we had the opportunity to update the butterfly, we chose the largest species in Africa, Papilio antimachus. Notice the coloring on the leaves. You can almost see the sunshine reflecting off them. What a thorough vacuuming and careful painting can do! 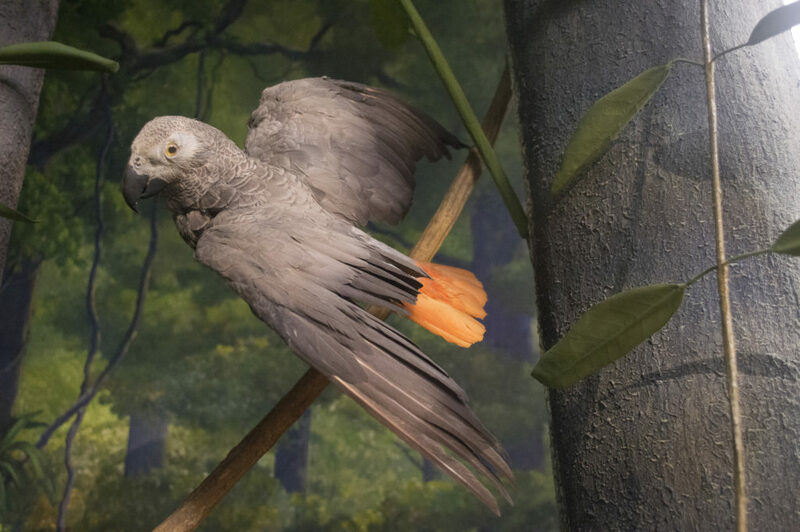 The African grey parrot can no longer hide in the dense forest; it’s accurate, blindingly bright red tail feathers are a dead giveaway. To clean every leaf, branch and tree trunk of every plant was a laborious task, not to mention repainting some models and replenishing most of the leaf litter with real leaf litter. 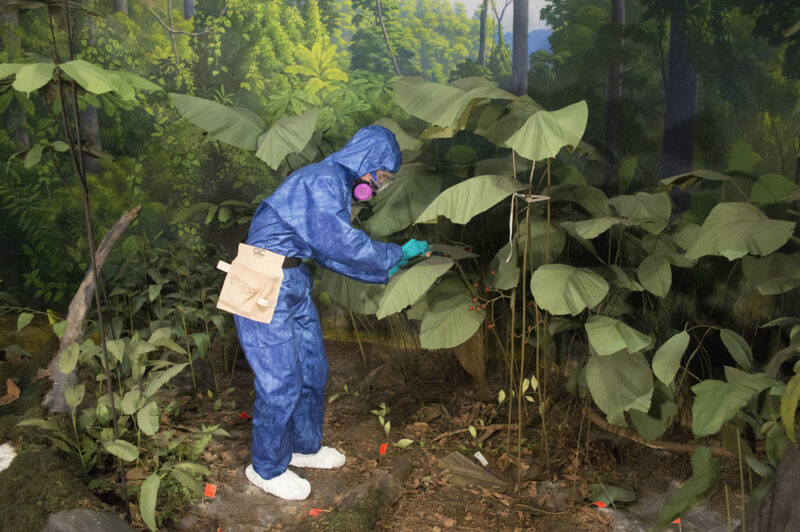 To do the job, Exhibition Designer Lauren Duguid donned head-to-toe protective clothing to seal out harmful toxins and decades of dust. Early in the process when Academy staff was planning the renovation, someone noted that there were no snails in either the gorilla or the takin scenes. Snails occur naturally in both ecosystems, so why not add them! The snail camouflaging itself among the leaves in the photo was made by Fred Mullison, whose day job is preparing 365-million-year-old fossils for future study. Can you spot the snail slime? Is it real? Come to the Academy to see these splendid dioramas for yourself. You can purchase discounted admission tickets online at ansp.org. And look for Dioramas Revealed, Part 2 which showcases the takin diorama renovation. Images by John Hutelmyer. Post by Carolyn Belardo with Lauren Duguid. 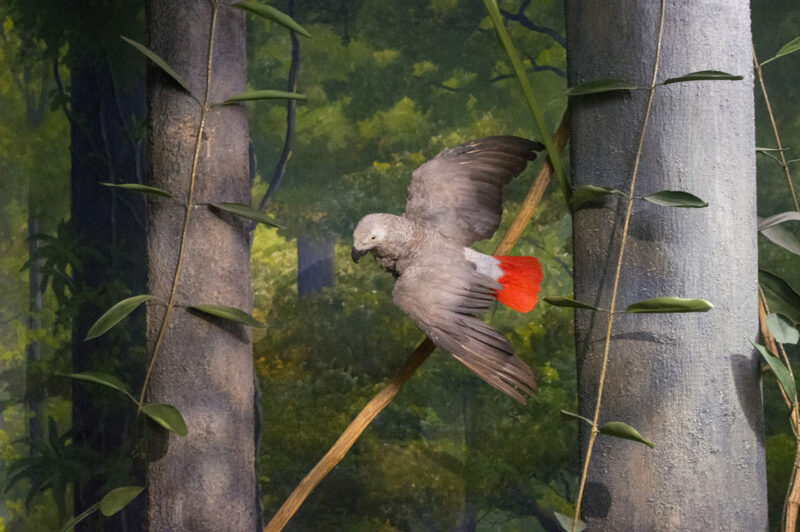 To read more about how the Academy updated and corrected some scientific inaccuracies in the dioramas, see the story in today’s The Philadelphia Inquirer/philly.com.